Here is the latest collection of best truth or dare questions clean for every kind of party and people. Not everyone like to play dirty truth or dare questions. 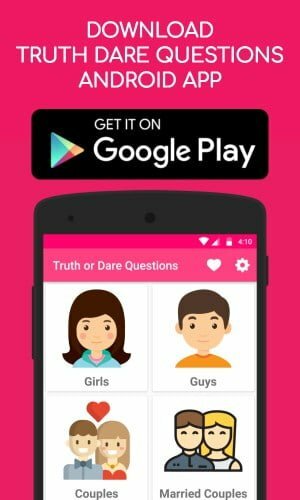 Few might like clean truth or dare questions and if you are one of them, this article today is waiting for you. We have collected the best list of truth or dare questions clean for couples, kids, adults and married couples. Have you ever tried to get the first rank in your class? How many times you self-motivated yourself? What is the most beautiful picture you’ve ever taken? How many times did you lie to your friends which hurts them? Which type of opposite gender dresses would you like to wear? Have you ever try to steal any costly thing from your friend’s bag? How many times do you take your bath in a day? Have you ever tried to blame others even though that mistake is yours? What is that one thing, your friends always think about you which is totally wrong? How many times did you cheat your friends? What was the most embarrassing thing that happened to you at your best friend’s wedding? Have you ever feel disappointed for your marks in final examinations? What is that one thing you’ll never share with your friends? What is the most horror video you saw on YouTube? Have you ever slipped in the bathroom? How many times you tried to kiss your crush but failed? Have you ever demand money from your grandparents? What is the ugliest place you’ve ever pee? Who is that person you want to know all their secrets? What is the most embarrassing post you posted on your Facebook or Whatsapp? Have you ever refused to wear inner when you’re in childhood? What is the most embarrassing thing you did in front of your parents? Which secret of yours would you like to share with your friends immediately? What is the most embarrassing time you farted? Why did you break up with your last crush? What are the most embarrassing things you always keep with you? Have you ever did naughty things with your crush in your dreams? What is that one terrible thing you did to cover your lie? At what age you stopped peeing in your bed? What is the biggest lie you told to your parents but get caught? Have you ever try to do horrible things? Who is the sexiest person you always wanted to meat? What is the costliest thing you had with you now? What is the weirdest joke you’ve ever played on your friend? Have you ever did wrong to your friends but he/she didn’t notice it till now? Who is the last person saw you while you’re without cloths? What is the delicious item you’ve ever eaten in your entire life? What is the embarrassing nickname you’ve ever given to your best friend? Have you ever want to see someone without cloths? What is that person’s name who have you loved, but they did not love you back? What are the five things that you like most about you? How often do you play music with your lunch box and spoon? What kinds of thoughts are running through your mind about your crush? What are your career plans for your future? If you have one option to choose either making out or $1 million, which one would you pick? What is the funniest habit you have? Have you ever felt bad about your height and weight? What is that one thing you want to do now with your crush? Which type of songs did you hear most? What are the five things you wish to have with you in your future? Do you want to continue your studies along with your job? What is the funniest movie you’ve ever watched? Which one of your best friend’s crush has the perfect body shapes? Have you ever tried to cook something new dish and failed? What was the funniest thing that happened to you at a shopping mall? Have you ever tried to kiss your crush in public place? If someone made a film about your life, which title would you like to give that movie? How often you say I Love You to your crush? Do you really trust your parent’s decision? How often do you pray to god for your needs? Hope you like these clean truth questions in our list of truth or dare questions clean. Let’s check the second half ie. clean dare questions for everyone. Act like your mother when she was pregnant. Stand on your toes for 5 seconds. Wear your pants and shirt blindfolded. Roar like a cat and dog. Make a prank call to your grandmother and ask money for your needs. Act like you slipped on a banana peel. Go to your house terras and say “Happy Married Life” as loud as you can. Lick three ice cubes until they melt. Sniff any one of your friend’s mouth. Keep your favorite dress under your foot for ten minutes and wear it. Open your mouth as wide as you can. Eat three boiled eggs at a time. Eat five hot chilly at a time without drinking water. Wear your socks to your hands for 10 minutes and smell your hands. Spin around 30 times blindfolded and do back walk. Wash your hair using dish wash soap. Place three glasses on your head for three minutes without touching them. Rub your friend’s toes using yours for two minutes. Allow someone to close your nose for one minute. Imagine broomstick as your crush and do a romantic conversation with it. For the next 10 minutes, sing your favourite songs. Start your sentence with the word “What the Hell” for next 5 minutes. Try to eat some food without touching it. Use your comb as a microphone and sing any romantic song. Walk like a robot for two minutes. Dip your entire clothes in water and wear them for entire day. Try not to blicn your eyes for 40 seconds. While talking for next 5 minutes, start every sentence with “I’ll kick you if you don’t hear my words”. Remove any one of your friend’s socks and wear it on your head. Laugh as loud as you can. Remove all your cloths with only one hand. Make sounds like a lizard for next 10 minutes. Do your favorite animal impression for 2 minutes. Give high five to everyone for 2 minutes. Using your armpits make fart sounds. Dance to your favorite dance for 5 minutes. Do 5 cartwheels in a row. Give your piggyback to someone for one entire day. Lift someone using your legs. Act how you react in front of the dead body. Pour sauce on your friend’s left hand and lick it. Let someone shave on any part of your body. Lick one drop of hair oil. Ask someone to open your pants zip when you’re in public toilet. Bite your toenails using your teeth. Place your lips on three ice cubes until they melt out. Act like someone’s pet and eat whatever they feed you. Snake dance for 2 minutes. Ask someone to make fun of you. Show your expressions, if you’re in the burial ground at midnight. Perform any magic trick you know. Remove any one of your friend’s shoe laces with your teeth. Imitate your favorite comedian until your friends laugh loudly. Slap yourself as loud as you can. Go and stand in front of your mirror and split yourself. Keep five ice cubes in your pant pockets and run until they melt. Watch all your liked videos on YouTube two times continuously. Call your best friend’s name five times in a romantic way. Hope you like these clean dare questions in our list of truth or dare questions clean. Try our list of truth or dare questions clean if you are playing truth or dare game with your friends or partners. These truth or dare questions clean will make the game very interesting.